Platform view of the station, with one side lacking shelter. 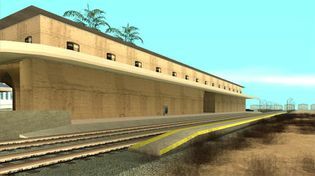 Linden Station is a railway station in Grand Theft Auto: San Andreas. Linden Station is a Brown Streak Railroad railroad station that service's the eastern portion of Las Venturas, San Andreas. It is situated in the Linden Side district, and is part of the Brown Streak Railroad. Linden Station is one of the two officially designated rail stations in Las Venturas, the other being Yellow Bell Station in the Prickle Pine district. Both stations happen to share a similar station building design, although Linden Station is less decorated than Yellow Bell Station, lacking cast iron ornaments. The station also features a second nigh-identical building away from the railway that is of unknown use. North of the station is the Sobell Rail Yards, while to the south is Rockshore East. They are also both passed over by the Brown Streak railway system. This page was last modified on 31 July 2012, at 01:01.